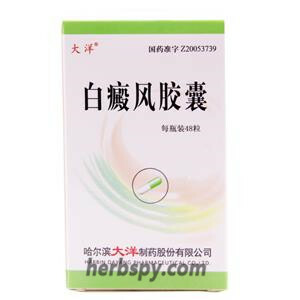 It is used for vitiligo due to qi-stagnation and blood stasis and meridian stagnation. Regulating of qi and blood,promoting blood circulaiton to remove blood stasis and remove ecchymosis. Puncturevine Caltrop Fruit,Gromwell,Rosewood Lignum Dalbergiae Odoriferae,Bistort Rhizome,Blackend Srallowwort Root,Peach Seed,Safflower,Prepared Fleece flower Root, Liquorice Root,Stir-fried Atractylodes Rhizome,Chinese Gentian Root,Oriental Stephania Root,Cuttlefish Bone. This product is gray-yellow to tan water pill; the gas is slight and the taste is slightly bitter. For oral use after meals,2.5g (15 pills) twice daily or by medical ordor. Stage Food and Drug Administration Approval number:Z20025334.